“It’s got that sizzle going—I love it,” said Dr. Sian Proctor as she fries rice and turkey Spam inside a two-story geodesic dome on an abandoned quarry in Muana Loa, Hawaii. She is one of six participants living in the Hawaii Space Exploration Analog and Simulation (HI-SEAS) habitat, researching food preparation strategies for long-term space exploration on Mars or the Moon. The study is led by Cornell University and the University of Hawaii at Manoa and is funded by grants from the NASA Human Research Program. 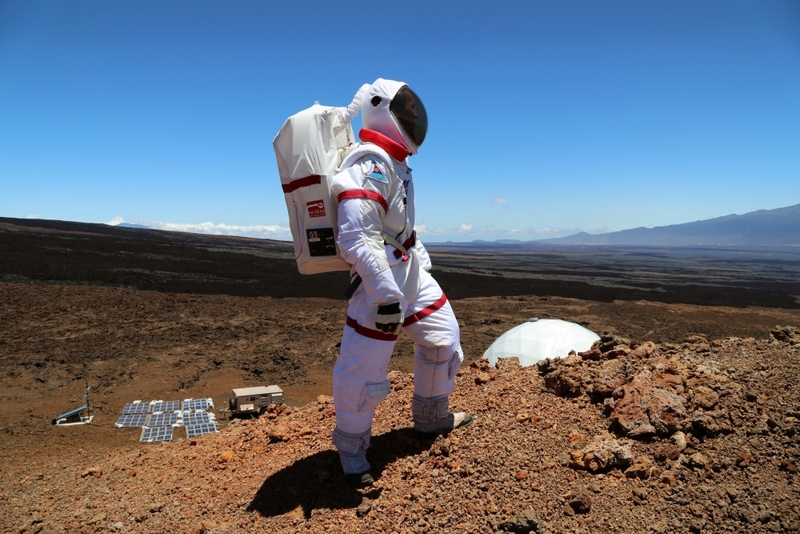 HI-SEAS researcher Dr. Oleg Abramov, pictured above, and the other crew members suit up for field trips outside the dome, pictured to the right (Credits: Angelo Vermeulen). The crew has already spent more than 80 days inside the 92 m2 structure, and they deal on a daily basis with a 20-minute real-time communication lag, restricted water use, and simulated space suits they must don any time they step outside the dome. Hawaii may be millions of kilometers away from Mars, but the HI-SEAS crew is doing their best to assume the closest stretch of ocean is, in fact, a black expanse of deep space strewn with stars. And that means no fresh fish. Instead, dried shrimp and canned anchovies, salmon and tuna will have to do. The selection pales in comparison to the real world, but these six researchers at least have an advantage over the astronauts on the International Space Station: creative license. By blending together shelf-stable ingredients to make meals instead of relying solely on just-add-water meals, the HI-SEAS crew is attempting to fend off “menu fatigue,” a phenomenon describing the weight loss of astronauts who lose their desire to eat the same ready-to-go meals for weeks on end. The study requires the participants to cook their own meals half of the time and for the other half to eat pre-prepared meals like creamy wild rice soup or lasagna with meat sauce. It then measures the participants’ consumption patterns, moods, sensory functions like taste and smell, and overall nutrition. It also investigates how much of the so-called menu fatigue relates to the astronaut’s change in sense of smell and, therefore, taste. The participants must complete nine surveys a day in addition to detailing their meals down to the ingredients’ mass in grams. 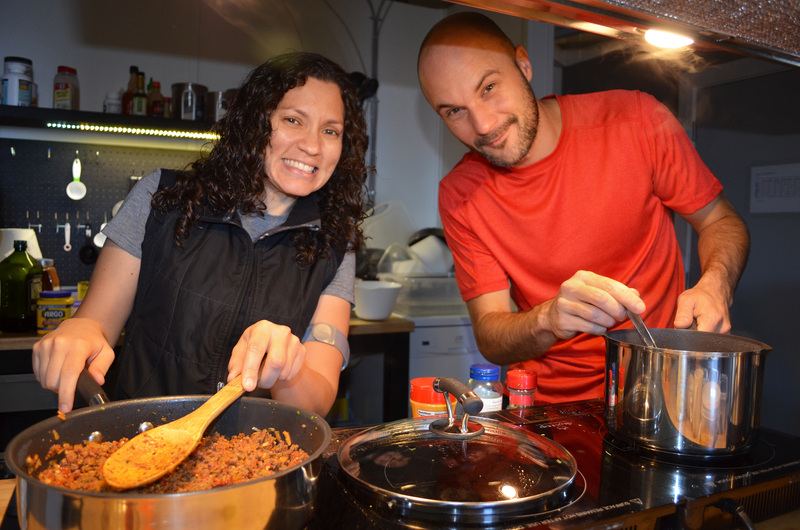 The crew members—composed of a few amateur or hobbyist cooks but no professionals—use an on-board cookbook but also make recipes submitted by the public during an open recipe contest prior to the 2013 mission. Some of these recipes include bean soup with herb biscuits, submitted by Joan Peterson; dark matter cake, submitted by Aquilla Elfindale; Martian skin, submitted by Brighton Grow; and, of course, Proctor’s Spam fried rice, submitted by A. Kirk McCarty. The social function of the HI-SEAS dinners are an integral element to psychological well-being during the study period. “As a commander I learned that it’s crucial to keep people talking and keep the group (physically and emotionally) together,” said crew commander Angelo Vermeulen, pictured right of crew member Dr. Yajaira Sierra-Sastre. “The worst that can happen is everyone working in their own little room all day long” (Credits: Dr. Sian Proctor). Crew cohesion will be paramount to future Mars missions, as a mission could require the astronauts to be isolated from family, friends, and other human contact for three years. If cooking improves the psychological and social wellbeing of the crew members, it would likely contribute to improved drive and, essentially, improved research. 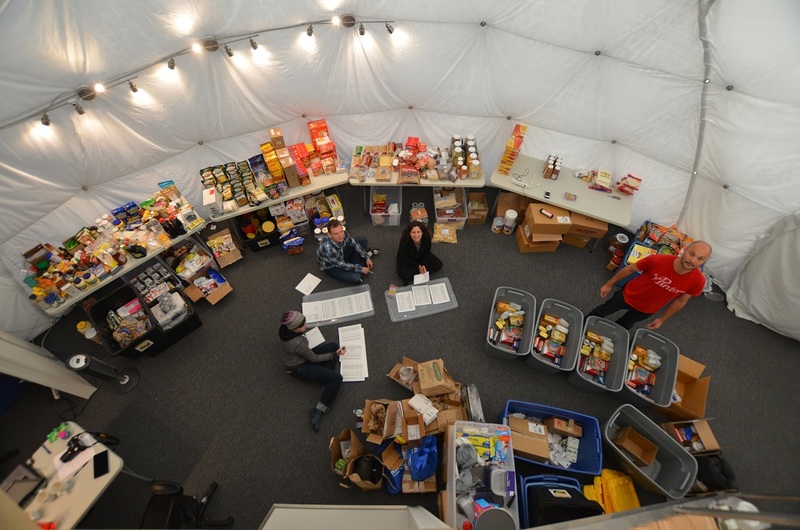 The HI-SEAS crew may have a limited selection of foods compared to the grocery store, but the inventory is large and varied compared to the choices current astronauts have (Credits: Dr. Sian Proctor). Many of the ingredients at HI-SEAS are not a far stretch from a college student’s dorm cabinet: crackers, chips, and hot sauce. Others are more refined: chorizo, dried lemon peel and currants, warranting the question: are these really necessary for a deep space mission? Another question is whether the benefit of shuttling these ingredients on a mission is worth any mass and volume requirements beyond what is currently used to feed astronauts. Some people believe NASA should move away from pre-packaged foods entirely–both shelf-stable ingredients and ready-to-eat meals–and instead look at a system that can be maintained and regenerated on-location. But the idea, stressed Binsted, is to figure out the most efficient selection of ingredients in terms of characteristics like cost, mass, nutrition, and—of course—taste. At the end of the study, the team should have a pretty good grasp of which ingredients to stock for a real Mars mission and which ones to leave at home. That means only taking what’s necessary—but having some fun along the way. That said, he does miss fresh vegetables. Dr. Binsted pointed out that the HI-SEAS food study is just one of many projects aimed at improving food in space. Douglas’ research at the Johnson Space Center on bioregeneration, for example, could bring Vermeulen his currently-craved veggies. “A bioregenerative system would have much higher crew time requirements than prepackaged food. It takes a lot of time to grow, maintain and harvest the crops,” said Douglas, noting that even a robotic system employed to do the work would still require human input at some point. As for the HI-SEAS study, the crew has about a month left at the dome. Michelle graduated from the Science Communication Program at the University of Tennessee in 2012. She is now a part-time freelance reporter based in Nashville, Tenn. and can be contacted via www.michellelavone.com. She loves being in nature, traveling, and writing about all the awesome things people do, think, create and know. Space Food Nutrition: And Don't Forget to Eat!